For other uses, see The Ugly Duckling (disambiguation). New Fairy Tales. First Book. First Collection. 1844. When the story begins, a mother duck's eggs hatch. One of the little birds is perceived by the other birds and animals on the farm as an ugly little creature and suffers much verbal and physical abuse from them. He wanders sadly from the barnyard and lives with wild ducks and geese until hunters slaughter the flocks. He finds a home with an old woman, but her cat and hen tease and taunt him mercilessly and once again he sets off alone. The duckling sees a flock of migrating wild swans. He is delighted and excited, but he cannot join them, for he is too young and cannot fly. Winter arrives. A farmer finds and carries the freezing little duckling home, but the foundling is frightened by the farmer’s noisy children and flees the house. He spends a miserable winter alone in the outdoors, mostly hiding in a cave on the lake that partly freezes over. When spring arrives, a flock of swans descends on the lake. The ugly duckling, now having fully grown and matured, is unable to endure a life of solitude and hardship any more and decides to throw himself at the flock of swans deciding that it is better to be killed by such beautiful birds than to live a life of ugliness and misery. He is shocked when the swans welcome and accept him, only to realize by looking at his reflection in the water that he has grown into one of them. The flock takes to the air, and the now beautiful swan spreads his gorgeous large wings and takes flight with the rest of his new kind family. Andersen first conceived the story in 1842 while enjoying the beauty of nature during his stay at the country estate of Bregentved, and lavished a year's worth of attention upon it. He initially considered "The Young Swans" as the tale's title but, not wanting to spoil the element of surprise in the protagonist’s transformation, discarded it for "The Ugly Duckling". He later confessed that the story was "a reflection of my own life", and, when the critic Georg Brandes questioned Andersen about whether he would write his autobiography, the poet claimed that it had already been written — "The Ugly Duckling". 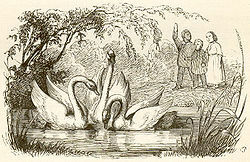 “The Ugly Duckling” was first published in Copenhagen, Denmark 11 November 1843 in New Fairy Tales. First Book. First Collection. 1844. (Nye Eventyr. Første Bind. Første Samling. 1844.). For the first time the phrase "told for children" was not part of the title—an omission Andersen scholar Jackie Wullschlager believes exhibited a new confidence on Andersen's part: "These [tales] were the most mature and perfectly constructed tales he had written, and though some of them at once became, and have remained, favorites of children, Andersen here melds together the childlike and the profound with exceptional artistry." The first edition of 850 was sold out by December 18, and Reitzel planned another 850. The tale was fourth and last in the volume that included (in contents order), "The Angel" ("Englen"), "The Nightingale" ("Nattergalen"), and "The Sweethearts; or, The Top and the Ball" ("Kjærestefolkene [Toppen og bolden]"). The volume sold out almost immediately and Andersen wrote on December 18, 1843: “The book is selling like hot cakes. All the papers are praising it, everyone is reading it! No books of mine are appreciated in the way these fairy tales are!” Andersen promoted the tale by reading it aloud at social gatherings. The tale was republished 18 December 1849 in Fairy Tales. 1850. (Eventyr. 1850.) and again 15 December 1862 in Fairy Tales and Stories. First Volume. 1862. (Eventyr og Historier. Første Bind. 1862.) The tale has since been translated into various languages and published around the world and has become the most famous story by Andersen. In reviewing Hans Christian Andersen: A New Life by biographer Jens Andersen, British journalist Anne Chisholm writes “Andersen himself was a tall, ugly boy with a big nose and big feet, and when he grew up with a beautiful singing voice and a passion for the theater he was cruelly teased and mocked by other children". The ugly duckling is the child of a swan whose egg accidentally rolled into a duck's nest. Speculation suggests that Andersen was the illegitimate son of Prince Christian Frederik (later King Christian VIII of Denmark), and found this out some time before he wrote the book, and then that being a swan in the story was a metaphor not just for inner beauty and talent but also for secret royal lineage. Bruno Bettelheim observes in The Uses of Enchantment that the Ugly Duckling is not confronted with the tasks, tests, or trials of the typical fairy tale hero. “No need to accomplish anything is expressed in “The Ugly Duckling”. Things are simply fated and unfold accordingly, whether or not the hero takes some action.” In conjunction with Bettelheim’s assessment, Maria Tatar notes in ’’The Annotated Hans Christian Andersen’’ that Andersen suggests that the Ugly Duckling‘s superiority resides in the fact that he is of a breed different from the barnyard rabble, and that dignity and worth, moral and aesthetic superiority are determined by nature rather than accomplishment. According to Carole Rosen, the story was inspired in part by Andersen's friend Jenny Lind. "The Ugly Duckling" became one of Andersen's best loved tales and was reprinted around the world. The tale was adapted to a variety of media. Films based on the tale include two Silly Symphonies animated shorts produced by Walt Disney called The Ugly Duckling. The first was produced in 1931 in black and white, and a remake in 1939 in Technicolor. The latter film won the 1939 Academy Award for Best Short Subject (Cartoons), and was the last Silly Symphony to be made. The main difference between the Andersen story and the Disney version is that, in the latter, the little bird's ordeal lasts for only a few minutes, not for months. In 1936, the Fleischer brothers adapted the story for their animated short "The Little Stranger", reversing the story by having an odd chick born into a family of ducks. In 1956 the Soviet animation studio Soyuzmultfilm produced its own 19 minutes version of The Ugly Duckling. The anime Princess Tutu is about a duck that turns into a swan-like ballerina. In 2006, the Danish animation studio A. Film produced a spin-off CG feature called The Ugly Duckling and Me!, and later produced a children's CG television series Ugly Duckling Junior which featured the same characters as the movie. The 1954 Tom and Jerry cartoon Downhearted Duckling is also based on the famous story. The tale has seen various musical adaptations. In 1914, the Russian composer Sergei Prokofiev composed a work for voice and piano based on Nina Meshcherskaya's adaptation of the tale and, in 1932, arranged the work for voice and orchestra. This was transcribed by Lev Konov in 1996, and his opera was a great success in Russia. Other musical versions include the song “The Ugly Duckling” composed by Frank Loesser and sung by Danny Kaye for the 1952 Charles Vidor musical film Hans Christian Andersen, and Honk!, a musical based on the tale which was produced in Britain and won an Olivier Award. The tale was adapted to a musical by Gail Deschamps and Paul Hamilton with a planned United States tour 2002-2003. In 1998, the musical played the Piccolo Spoleto for seventeen days. In 1999, Jerry Pinkney adapted the story as a children's picture book. In 2009, the Dance Theatre of Bradenton, Florida, presented the ballet version of the popular tale (Allison Norton: The Ugly Duckling). In 2010, Garri Bardin directed a feature-length stop-motion musical of the story set to Tchaikovsky's ballet music. In 2012, a musical adaptation of the story, with ten original songs, was released by JJ’s Tunes & Tales. The album, titled “The Ugly Duckling: Story with Songs” contains both songs and spoken narration, and was released independently on CD Baby and iTunes. Examples of song titles include: Hatching of the Eggs; A Better Place; Song of the Swans; What’s the Matter with You; It’s a Big, Big World; Pretty Good Place to Live. GivingTales – in 2015 a storytelling app for children was created in aid of Unicef. The Ugly Duckling read by Stephen Fry is included in this collection of fairy tales along with other stories. ^ a b c Tatar, Maria (2008). The Annotated Hans Christian Andersen. W.. Norton & Company. pp. 99–118. ^ Bredsdorff, Elias (1975). Hans Christian Andersen: The Story of his Life and Work 1805-75. Phaidon. ISBN 0-7148-1636-1. ^ "Hans Christian Andersen - FAQ: Books by Hans Christian Andersen". Hans Christian Andersen Center. ^ "Hans Christian Andersen: The Ugly Duckling". Hans Christian Andersen Center. ^ Chisholm, Anne (2006-06-05). "The tale of an ugly duckling". The Daily Telegraph. ^ Philip, Neil (2005-01-08). "The Little Prince". The Times. ^ "The 1939 Silly Symphony". The Internet Animation Database. ^ "GMT: The Ugly Duckling". ^ "The ugly duckling". worldcat.org. Online Computer Library Center. Retrieved January 12, 2017. Wikimedia Commons has media related to The Ugly Duckling. The Ugly Duckling in full length.